← Nisyros: Some things are just weird! Thursday and my last full day on Nisyros. The island’s ferry has not been fixed, waiting for a part from Germany apparently. Maybe next week. Locals doubt it. So I have to leave the island on Friday in order to catch the ferry to Amorgos on Saturday. We long ago realised that such things are part of small island life. Shrug of the shoulders and get on with things. If travelling somewhere is time-critical then gather as much information as you can, weather forecast, state-of-the-sea forecast, information on ferry schedules from as many reliable sources as you can find ….. and build in a contingency. Having opted for a ‘photo-opportunity’ walk yesterday I went for footpath exploration on Thursday. 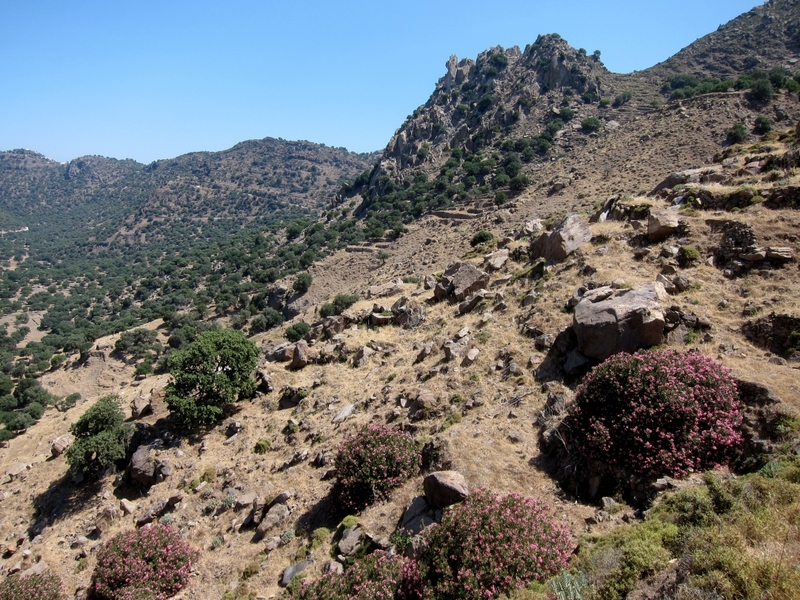 I knew that there was a path of sorts going part way around the inside of the crater rim between the villages of Nikia and Emborios before reverting to the road but had never been enthused by the idea. 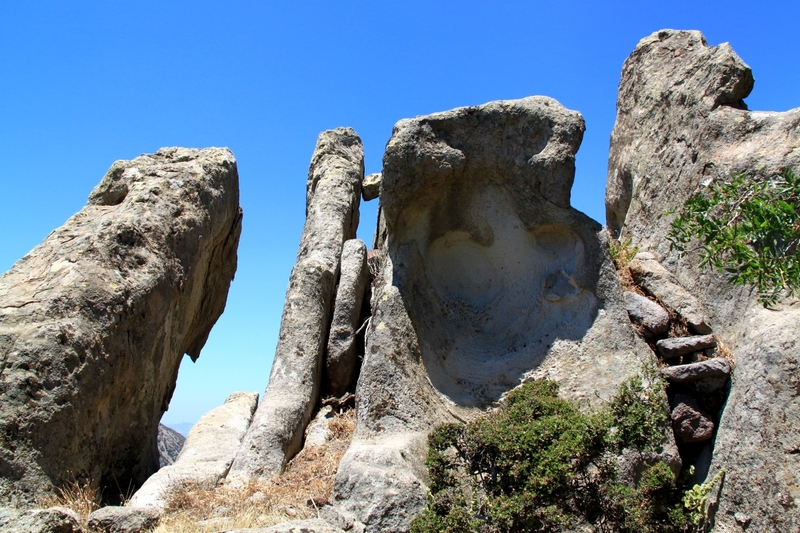 I had recently read in the book on Nisyros about an ancient fortification called Parliata built into the top of a volcanic plug high above the crater and this turned out to be on said path. I decided a new path and a new fortress would be a good last day. It wasn’t just good it was brilliant! I had to take the volcano trip bus as the island’s public bus is still running a less than skeleton service. Then I walked up the kalderimi leading to Nikia, taking my time to soak in the view as this would be the last time for a while. I remembered similarly stopping to soak in the views down to the harbour on our last day on Symi 2 years ago. Who knows what lies ahead. The kalderimi intersects a path just before reaching Nikia and the way to Emborio is in the opposite direction so I didn’t actually go up into the village. 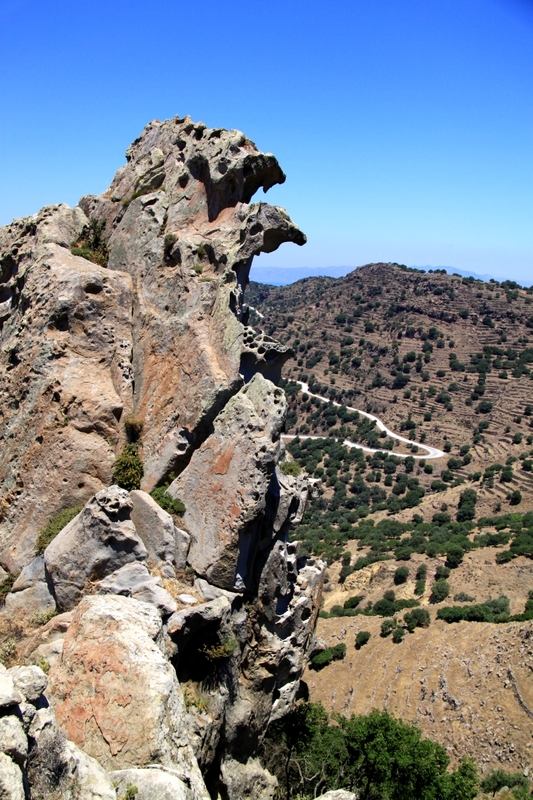 However, the views back towards Nikia were quite spectacular with fingers of lava pointing dramatically upwards. The path was narrow along the top of a high terraced wall down to the left and a similarly high terraced wall up to the right. The very helpful tour guide on the trip bus doing the chat for her small group of 5 in a European language (which I decline to name for reasons which will become clear) had included some English explanation for the rest of the passengers. 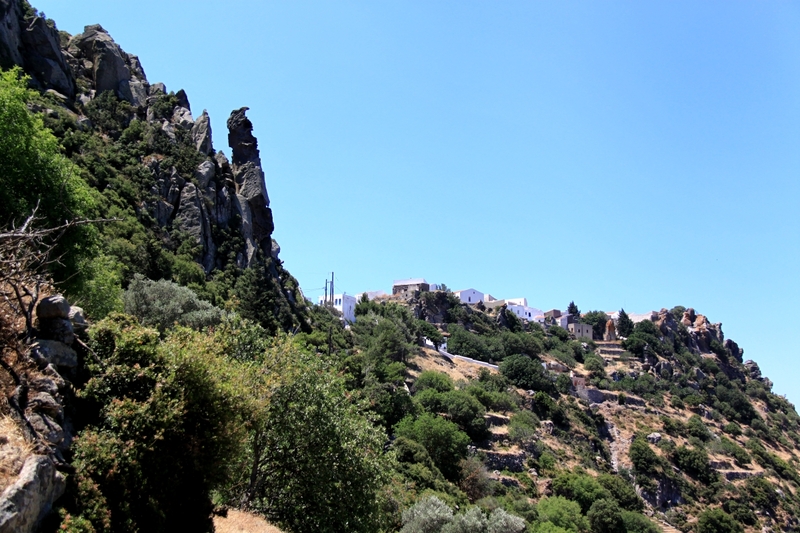 This included reference to the fact that Nisyros had very little agriculture and that the terraces had been built to stop rocks falling down. How can you trust anything else she said when there is glaring error like that! The stone walls to my right and left were about 8 foot high, for the most part very solidly built, and the fields they created were quite evidently still harvested for straw. Historically this was one of the richest agricultural islands in the Aegean if not the whole Mediterranean with a rich economy and culture. Anyway, back to the path. It was very good, picking it’s way more or less level around the inside of the rim of the caldera and passing huge outcrops of lava plugs. 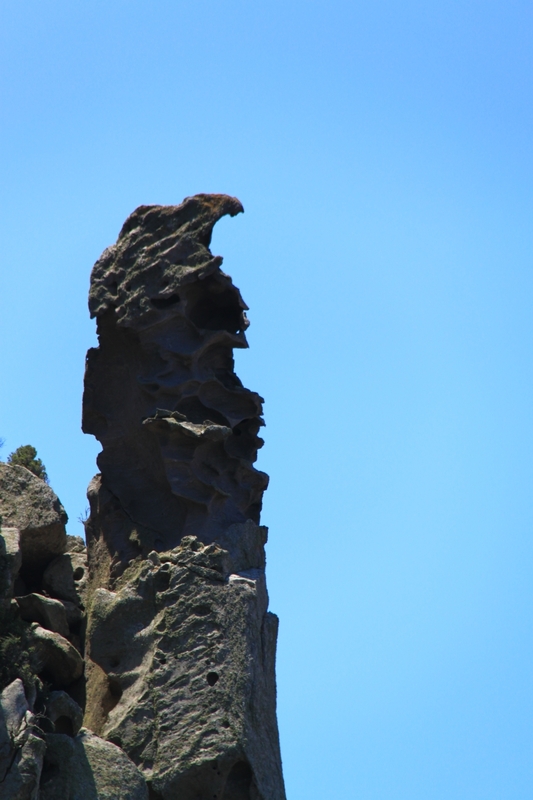 The rock shapes were fascinating and I clicked away with the camera compulsively. I would take the same shot 3 or 4 times just to try to improve on the composition, trying to force my thoughts into the camera. The path was pretty good for the most part. But then it became completely choked by holly oak and quite impenetrable. Elementary rock climbing skills were useful as I climbed up the 8 foot wall to the terrace above and followed that until the path was clear again and then climbed back down. In a few places there had been landslips and terraces, walls and path had become loose scree. No real problem but it isn’t a path for the trepid. Which was odd because part way along it there was a new sign on a post saying that this was ‘Geotrail 5, The Nikia – Parlatia lava flows’. No fear that anyone will try to follow the Geotrail because there is no information about them anywhere on the island. I know. I’ve tried to find the information cards which the internet tells me have been published. Not only not available but their existence is unknown. At one point the path passes through a small group of ancient houses with a huge marker stone before continuing up the small col behind the volcanic-plug that is Parlatia. The path continues in the direction of Emborio but I wanted to go up to the fortification itself. 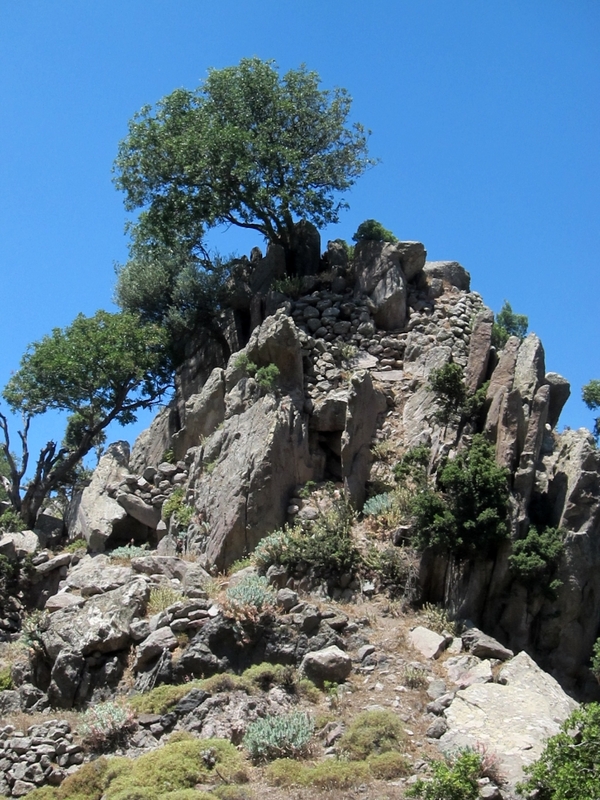 The only way up is to climb the crag which has been fortified with stone walls. It is one of the most amazing places I have been. I have often said that Nisyros is probably the most dramatic of the islands for walking and Parlatia simply adds another dimension to that. I had read that obsidian flakes have been found on the east side of the site which attest to its antiquity: there are. 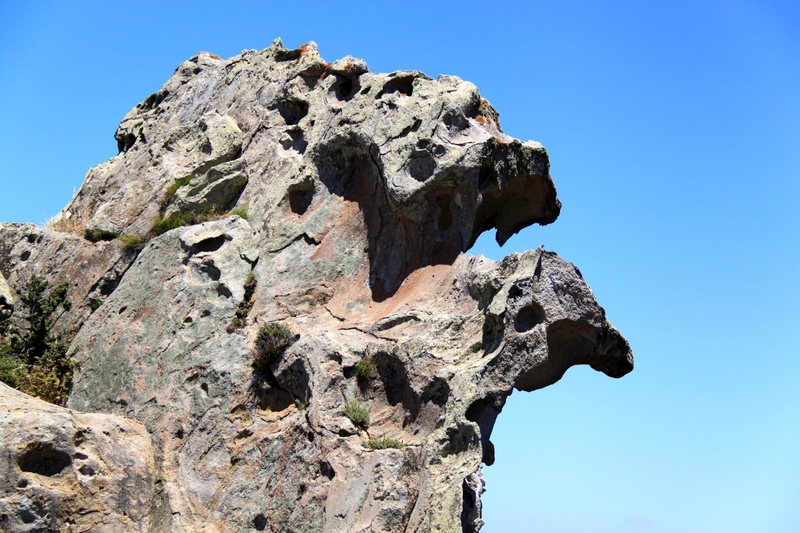 The lava is contorted into dramatic shapes. I couldn’t stop taking photos. 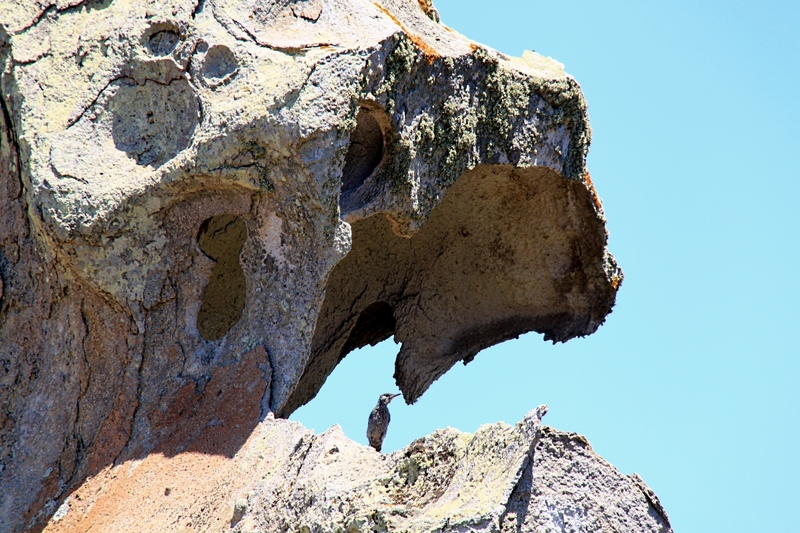 I was concentrating on taking shots of one lava finger which looks like the open mouth of a giant beast and was just zooming in for a close-up when a Blue Rock Thrush came and sat within the jaws. Doesn’t get much better than that. Shame my photo-skills didn’t do it justice. Just getting over the excitement of the Blue Rock Thrush and photographing another rocky outcrop when a Scarce Swallowtail butterfly came and settled in a tree in the shot. My shutter finger wouldn’t stop. 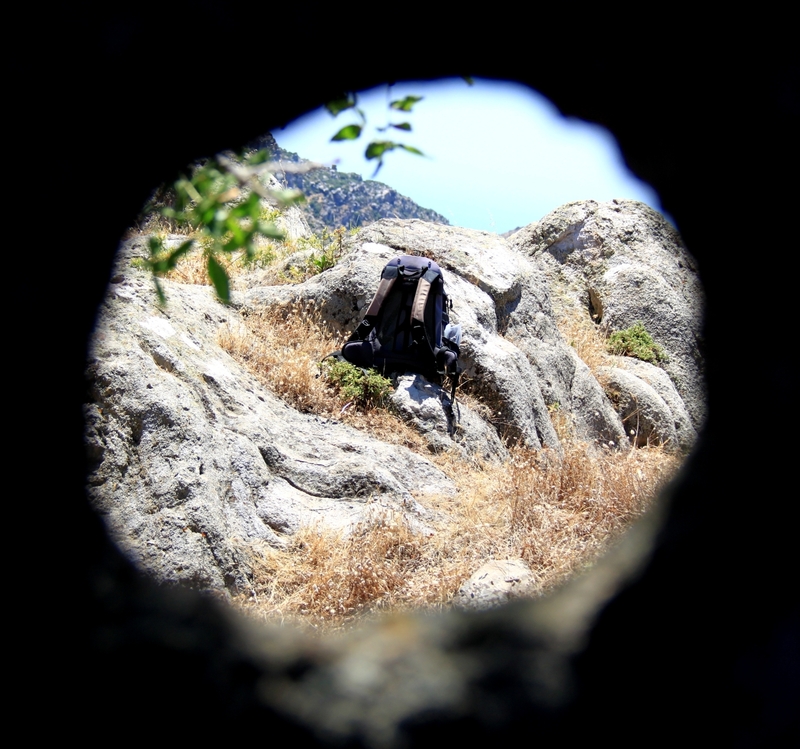 I even photographed my rucksack! But eventually I dragged myself away because i was still only half way between Nikia and Emborios. No sooner had I set out than a lizard, the type we used to call ‘Dragon Lizards’, lingered just long enough for me to rattle off a couple of shots. The rest of the path was rather more broke up and in places some interpretation of the topography of ancient settlements was needed to find it as it continued around the inside of the caldera. 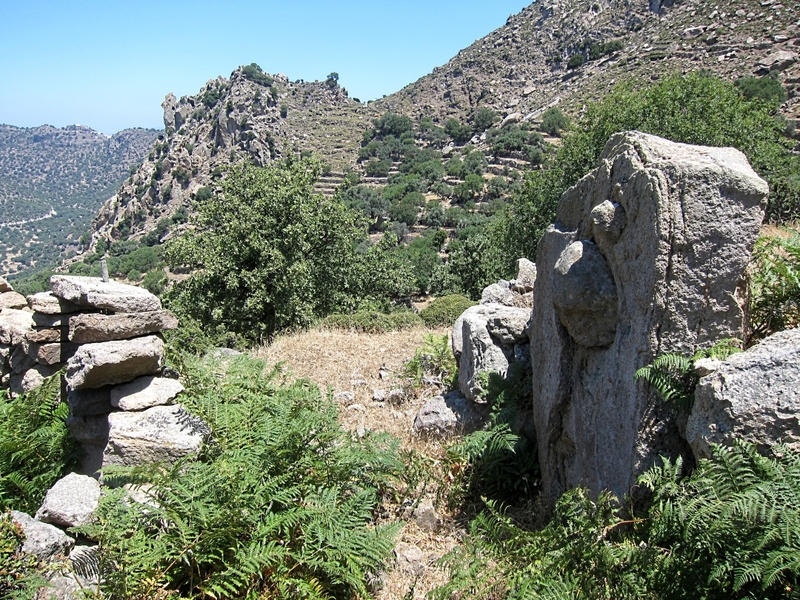 But I reached the road as intended and clomped along it for a kilometre before taking another piece of ancient kalderimi to emerge in the top of Emborios. 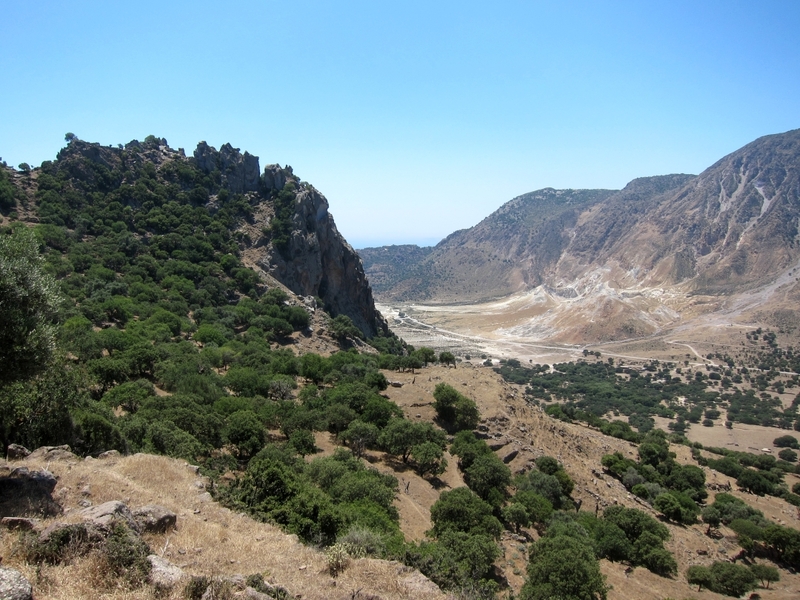 Frappé on the taverna balcony for a last look at the caldera and the crater and then 1½ hours back to town. Brilliant walk. Why has it taken me so long to do it? As long as you only keep snapping photos on your walk you will be OK. Snap anything else and life could be difficult! 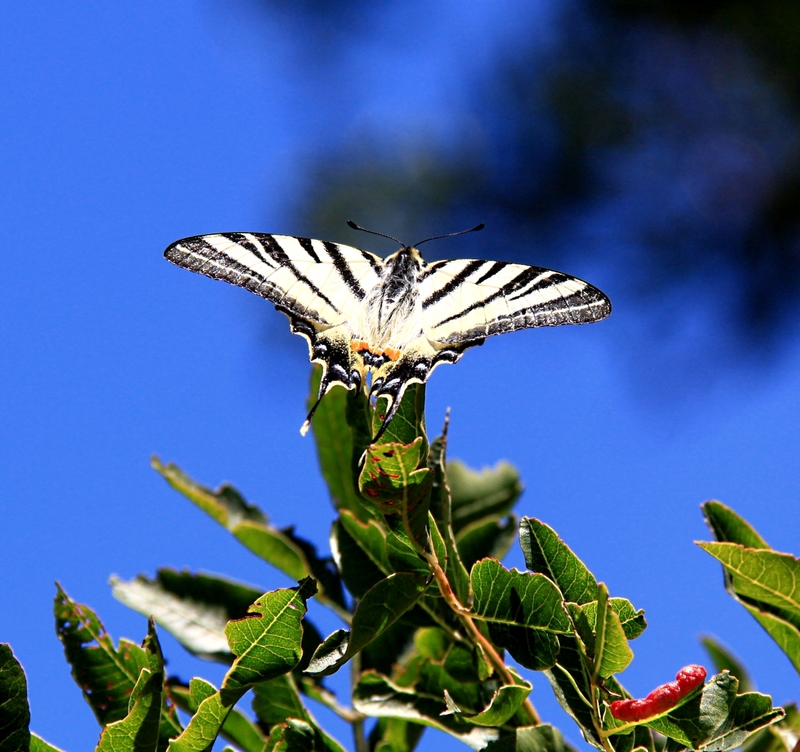 Fantastic photo of the Butterfly, which camera was it taken with?